The Flintstones, an American animated television series created by Hanna-Barbera Cartoons, is one of the most successful animated television series of all time, originally running in American prime time for six seasons, from 1960 to 1966, on the ABC network. One source of the show's humor was the ways animals were used for technology. For example, when the characters took photographs with an instant camera, the inside of the camera box would be shown to contain a bird carving the picture on a stone tablet with its bill. In a running gag, the animals powering such technology would look directly into the camera at the audience, shrug, and remark, "It's a living," or some similar phrase. Another commonly seen gadget in the series was a baby woolly mammoth being used as a vacuum cleaner. Being set in the Stone Age allowed for endless gags and puns that involved rocks in one way or another, including the names of the various characters being "rock" puns; some such names included celebrities such as "Cary Granite", "Stony Curtis", and "Ann-Margrock." The series directly drew from The Honeymooners for its main quartet of characters: the blustering Fred Flintstone and his ever-patient wife Wilma Flintstone (née Slaghoople, though Pebble was also given on occasion) modeled after the Kramdens, and their friendly neighbors Barney Rubble and wife Betty Rubble (née Betty Jean McBricker) modeled after the Nortons. 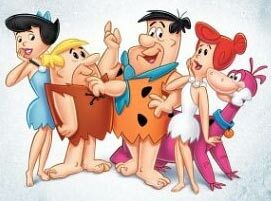 Later additions to the cast included the Flintstones' infant daughter Pebbles Flintstone and the Rubbles' abnormally strong adopted son Bamm Bamm Rubble. The Flintstones had a pet dinosaur named Dino (pronounced DEE-no, and which barked like a dog), and the Rubbles had a kangaroo-like animal named Hoppy. Fred Flintstone worked at a stone quarry and worked for several different bosses, the best known of which was the bald Mr. Slate. The Man Called Flintstone is an American animated musical motion picture produced by Hanna-Barbera Productions and released in 1966 by Columbia Pictures. 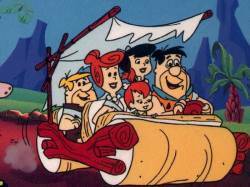 The film is a theatrical spin-off of the 1960-1966 television series, The Flintstones, and is considered the official swan song of the classic TV show as it was made immediately following the end of production on the series. The Man Called Flintstone is a spoof of the James Bond films, and also borrows elements from several episodes of the Flintstone TV series. In the film, Fred Flintstone (voiced by Alan Reed) is recruited by a secret organization to take the place of an injured agent who happens to be Fred's doppelgänger. His mission: to travel to Europe (under the guise of a family vacation) and catch the evil Green Goose (voiced by Harvey Korman). The catch is Fred is unable to tell his family or friends about the mission. Mel Blanc once again provides the voice of Fred's sidekick, Barney Rubble. The movie includes numerous musical interludes, including one song performed by Louis Prima. The Man Called Flintstone was a minor success upon its original release, but in the succeeding years became more popular at cinema matinees, and on television. In 2005, a North American DVD version was released, however due to licensing complications only a Canadian release occurred; a United States release was cancelled and has not yet been rescheduled.